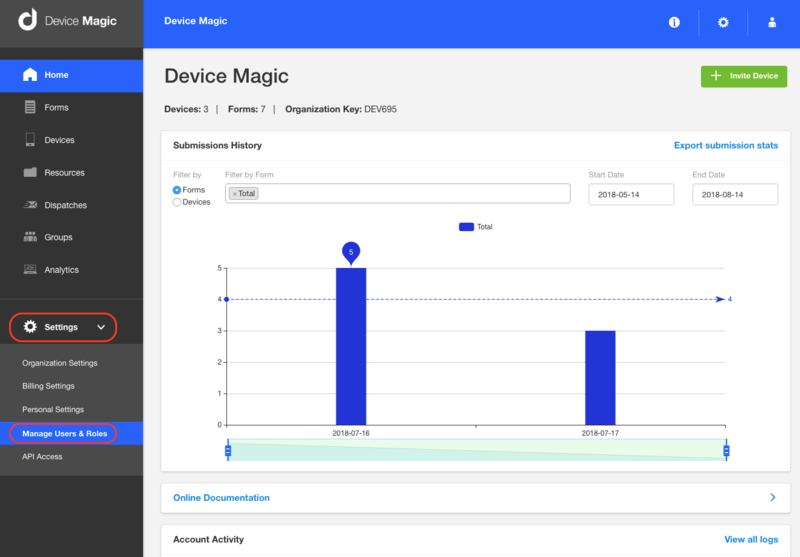 Device Magic administrators now have the options to add users and assign them roles within their organization. In this article, we'll give an overview of these two features. Firstly, after logging in to your account, navigate to your dashboard. On the left side of the page you'll see a "Settings" button. Click that button and then click the "Manage Users and Roles" link that appears underneath. You'll then be brought to a separate page. On your "Manage Users" page, you'll see your list of current users, their role, and when they joined your organization. You'll have the option to edit a user by clicking the pencil icon to the far right of the users information. To add a user, click the "Add user" link. Next, input the "User settings" for your new user and click the "Create user" link. Please note, if you leave the default role of "Owner" for your user, they'll have full administrator access to your account. If you ever need to edit a user's role, simply click the pencil icon in the row of the user. Then, navigate to the "Role" drop down and select the new role. Click "Update User" and your done! Next, we'll go over managing user roles. After creating your user, you'll be brought back to your "Manage Users" page. From there, click the "User Roles" link. 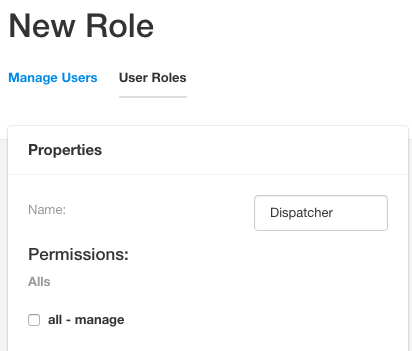 On your "Manage Roles" page, a list of your available roles will appear. To add a new role, click "Add Role". Then, you'll be brought to your "New Role" page where there will be a list of "Permissions" to choose from. There are multiple permissions to add to your role that range from being able to add a form to updating billing information. At the top of your "Properties" box, you can add the name of the role. In the example below, I chose the name "Dispatcher". 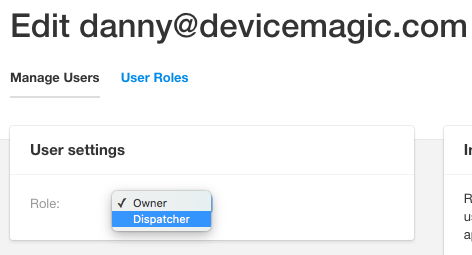 For this role, I only enabled Dispatch functionality. This user will only be able to read, create, update, and destroy dispatches. After selecting all of the needed roles, click "Create role". The "Manage Roles" page will then load with your updated list of roles. If you ever need edit a role, click the pencil icon to the far right of the associated role. This concludes our overview of managing users and roles. If you have any questions or comments feel free to send us a message at support@devicemagic.com or leave us a comment below.